This is the second of several planned “Notes from the Anacostia Ambassador” on this topic. You can read the first one here. The threat of displacement-caused-by-gentrification is not only due to rising rents. Low and stagnant wages also exacerbate the challenge of affording rent when a neighborhood becomes more expensive. The District’s Ward 7 and Ward 8 have the highest unemployment rates in the city, but they are also most proximate to vast parkland resources along the Anacostia River. What if the urban parks could become generators of new jobs? My predecessor, Katherine Antos, already highlighted the job creation benefits of cleaning up water quality with green infrastructure. Many groups in the watershed are training and connecting DC residents to new “green” jobs, including Groundwork DC , DC Water and Water Environment Federation’s National Green Infrastructure Certification Program, the Department of Energy and Environment and Latin American Youth Center’s River Corps. “Public demand has surged for ‘green’ innovations that make cities more environmentally friendly and more pleasant places to live. JFF examined the workforce needed to keep up with demand for green infrastructure systems and found that projected employment growth provides valuable opportunities for low-income, low-skilled workers to earn competitive wages. Meanwhile, as the National Park Services pursues its vision of Anacostia Park as a “signature urban park,” it grapples with its fair share of a (staggering) $11+ billion deferred maintenance backlog in national parks around the country. However, a recent study by the PEW Charitable Trusts showed that if funds were made available to return national park sites in DC and Maryland to intended levels of repair, the region would generate more than 14,000 jobs. These include jobs created directly by park restoration efforts (e.g. new construction jobs) and those created by additional money circulating with the local economy as a result of new incomes. Parks don’t have to be putting shovels in the ground to create jobs, however. Parks can create jobs through daily operations, including programming, events and activities. According to the National Recreation and Parks Association’s research on both operations and capital spending on parks across the entire United States, two-thirds of all jobs created by parks in 2013 were related to operations, rather than construction. Urban parks around the country increasingly offer year-round calendars of programs and activities to activate otherwise underutilized park spaces. 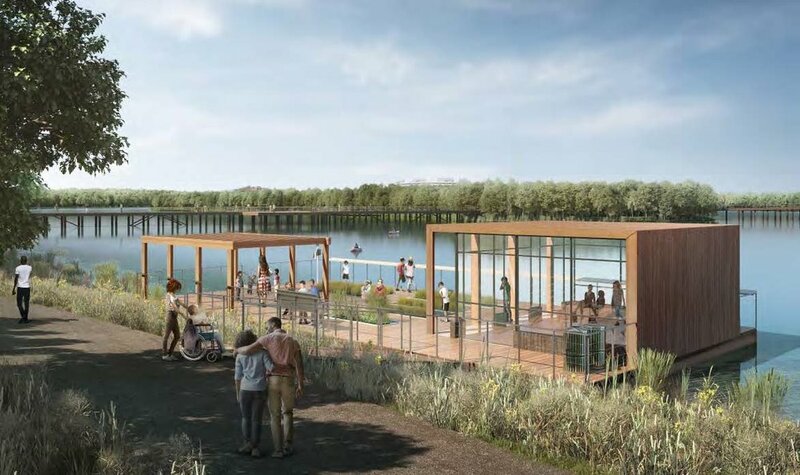 (The Philadelphia Parks Alliance investigated some of the best programs around the country that activated otherwise underutilized spaces, engaged low-income populations and connected communities to local waterways - a great read!). Many of the parks in Ward 7 and Ward 8 of DC are in the NPS portfolio. As National Capital Parks-East grows its relationships with community partners and organizations to help achieve its goals for Anacostia Park and other sites, and as the District anticipates a new and improved Kingman Island facility, NPS and DC could focus on hiring local residents for all phases from construction to operations and maintenance. Better educated communities have lower unemployment rates, and kids that learn outside have been proven to do much, much better in school. Meanwhile, higher educational achievement and degree attainment is directly correlated to higher incomes. CHILDREN PARTICIPATE IN ANACOSTIA WATERSHED SOCIETY'S SHAD RELEASE PROGRAM. PHOTO BY BECK HARLAN. With over thousands of acres of potential ‘outdoor classrooms’ along the Anacostia River and its tributaries, the District and Maryland school systems could leverage the improved watershed as a tool to improve educational achievement. There are already many organizations that engage with youth along the Anacostia River, including the Anacostia Watershed Society’s Saturday Environmental Program and school-based programs, the Student Conservation Association’s school-year and summer programs, DOEE’s Anacostia Environmental Youth Summit and many more. The steering committee behind the Year of the Anacostia includes a working group dedicated to enhancing coordination between environmental educators and youth programs, and the National Park Service aspires to visit local schools to offer educational programming content that relates to the history and ecology of the Anacostia waterfront. Meanwhile, Living Classrooms anticipates a contemporary indoor and outdoor learning campus on Kingman Island. DOEE'S PLAN FOR EDUCATIONAL SPACE ON KINGMAN ISLAND. As the District grapples with recent scandals in its school system and new legislation proposes new research into school practices, the District could intentionally invest more effort in connecting the curricula of schools to the Anacostia River and expose students to the many social, physical and academic achievement benefits of learning outdoors. The physical health benefits of park access have been so well documented that I couldn’t possibly highlight all of them here. The Trust for Public Land, Center for Disease Control and Prevention and National Recreation and Parks Association have all documented the benefits of trails and recreation. The National Park Service has embraced this research, and its Healthy Parks Healthy People program partnered with others to launch Park Rx America out of our own Washington, DC, a national program aiming to use parks specifically to address health issues in communities. THIS WOMAN MUST BE HAPPY BECAUSE SHE IS SURROUNDED BY SO MUCH VERDANT, THRIVING VEGETATION. PHOTO FROM UNSPLASH. Improving green space can be an important part of the effort to address these issues. As DC’s low-income and under-employed residents are increasingly concentrated in East of the River where they suffer poorer health and lower education performance than other District residents, neighborhoods in Ward 7 and Ward 8 may have the most to gain from high quality park infrastructure. Investing in parks—including the Anacostia waterfront—could simultaneously reduce stress, improve health, enhance education and create jobs in some of the communities that need it the most. In my next “Notes from the Anacostia Ambassador,” I will look at efforts from the Anacostia River watershed and around the world that demonstrate how the improvement of a park can maximize its value to low-income communities while minimizing its contribution to displacement.